In the past I have used different tools to ping a list of computers. One of the nicest was a rather old version of WhatsUpGold. It was quick to install and simple to use. 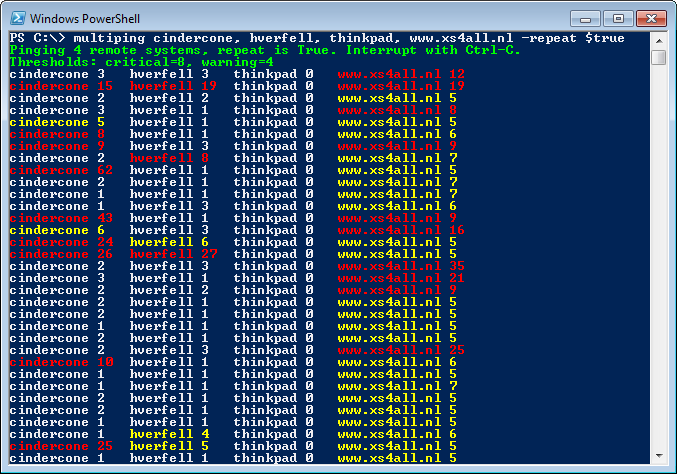 Now we have PowerShell on almost every Windows computer I wanted to have a solution in PowerShell, so I’m not required to install any dedicated ping software anymore. Here’s a simple script I wanted to share with you. It allows you to ping several computers at once. When a ping is over a configurable threshold output is displayed in yellow or red. Sends a ping to a specified host. Colors the output to indicate latency. Version 1.1. Provides a simple network monitoring solution, without the need to install any software. Sends a ping to ServerX every second. Repeats forever. Exactly what I was looking for – many thanks!